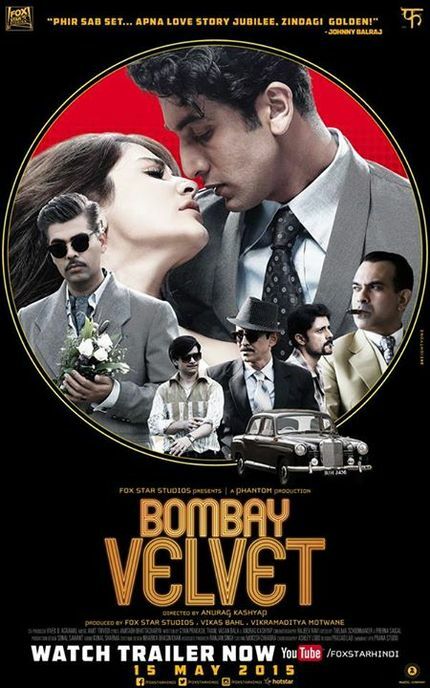 The first trailer for Anurag Kashyap's upcoming Bombay Velvet is finally here. The film, Kashyap's follow up to his critically acclaimed dark thriller Ugly, is a period gangster piece set in '60s Bombay. The film stars Ranbir Kapoor, who appears to be groomed to look like his legendary grandfather Raj Kapoor; Anushka Sharma, who recently proved her acting mettle in the gritty Deliverance style thriller NH10; and one of Bollywood's biggest directors Karan Johar in his first substantial role in a feature. The lead pair are reason enough to get me into the cinema on opening night. Kapoor has had a bit of a rough stretch over the last couple of years, but his one-two punch on 2011-2012 of Rockstar and Barfi! put him high on the list of Bollywood's leading men who can actual act. Sharma, on the other hand, has a nearly spotless record that includes several very interesting and engaging roles at which other Bollywood actresses might balk, however, she's proven to be very reliable and with NH10, extremely versatile. The wild card in the proceedings is Johar. Karan Johar the son of Yash Johar, one of Bollywood's most famous directors. Over the past 15 years, he has delivered some of the schmaltziest, over the top, ridiculous melodramas that India has ever seen, and that's not an easy list to make. His films include Kuch Kuch Hota Hai, about a man who reunites with a college buddy after his daughter's mother dies young, Kabhi Khushi Kabhie Gham, about a man who reunites with his family who disowned him after he fell in love with the wrong girl, Kabhi Alvida Naa Kehna, about a pair of cheating spouses who destroy their families through their own impenetrable selfishness, and My Name is Khan, about an Indian American Muslim with Asperger's who is determined to meet and speak with Barack Obama to tell him that he is not a terrorist, but not before saving a small Georgia town from flooding while singing We Shall Overcome in Hindi in their 1860's church house. After working parallel to one another on 2013's omnibus film Bombay Talkies, Kashyap and Johar discovered a mutual respect, and Kashyap swears that Karan Johar is shockingly good in the film. I've talked to one or two people who've seen Bombay Velvet in process and they confirm that Johar is pretty damned talented, so I'm excited to see what becomes of it. Bombay Velvet hits theaters around the world on May 15th.